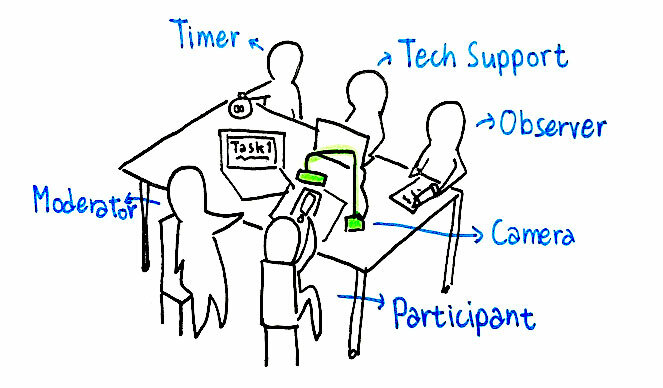 My Role: User Researcher. Main observer. Based on 15 usability testing sessions conducted in April 2017, our team has identified 5 most critical usability issues, provided a corresponding list of recommendations, as well as insights (likes, dislikes, and suggestions) from our participants. 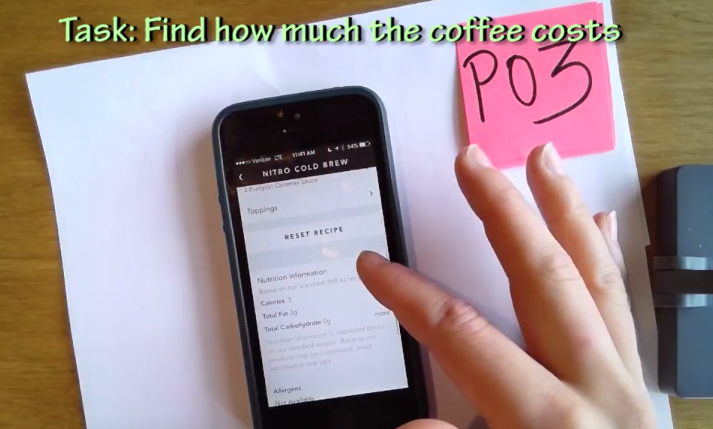 Identify potential usability and design problems in the current app. Analyze the issues to determine the causes. Provide recommendations for improving the usability of the app. In order to evaluate many of the app’s vast functions while keeping the sessions short, we created 3 sets of tasks — each with a different focus. These were all programmed in Qualtrics, which automatically assigned participants to one of the three task groups. To keep the conditions of our tests as natural as possible, we recruited participants and tested at a Starbucks Store. Each team member concentrated on a single role. Tasks with highest %Incomplete includes finding the cost, finding the last amount of money reloaded, and adding the minimum amount. 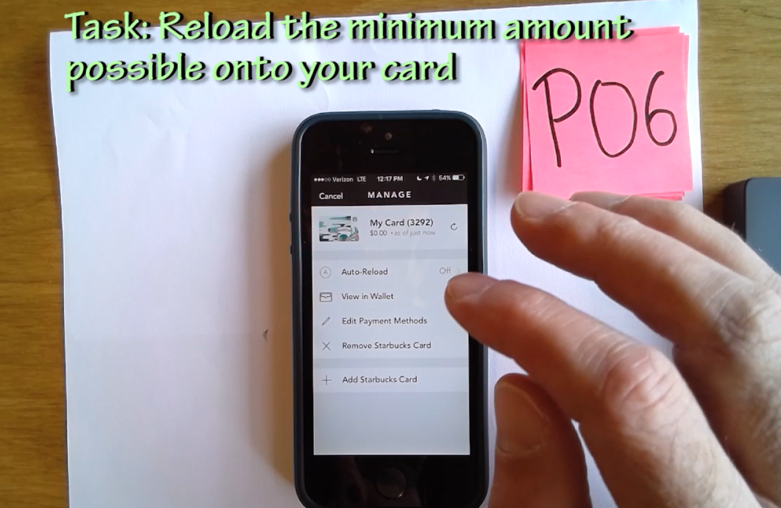 Participants spent the most time adding a credit card and adding money to the card. 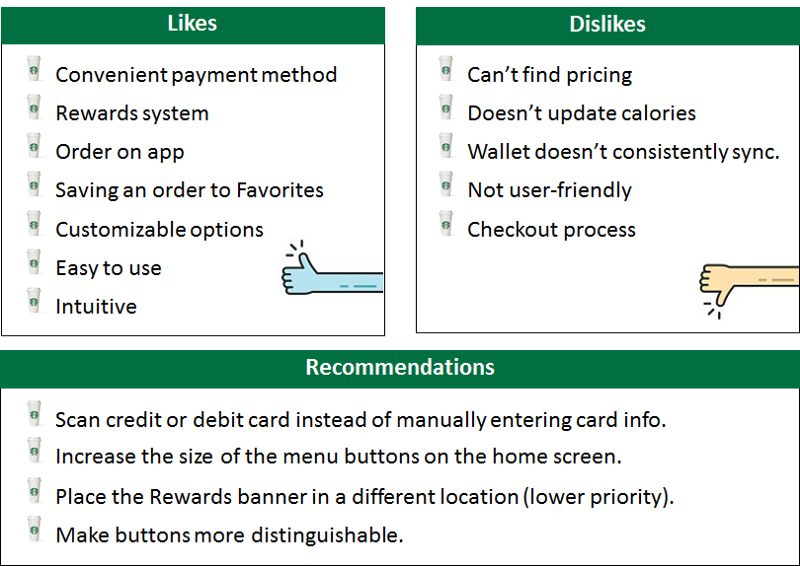 With a score of -29%, participants are not likely to recommend the Starbucks app to a family member or friend. 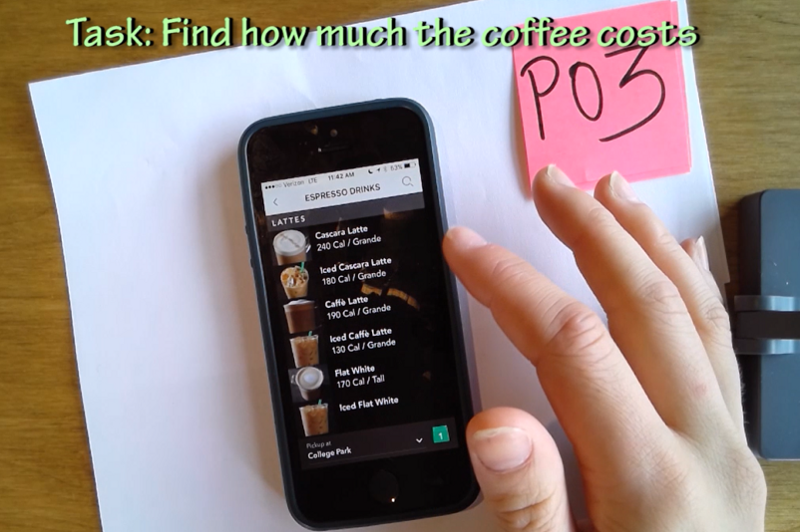 Participants likes the convenience of the app, but dislikes the complicated check-out process. From the results of our observations and surveys, we consolidated a list of usability issues and then evaluated them based on a severity rating scale of 0 to 5 (0 being not a problem, 5 being a usability crisis). The price is shown only after a user have gone through to the checkout section. Many users have expected the price to be shown earlier while they were selecting their items. After clicking on the drop-down list to select the reload amount, the users are shown options ranging from $25 to $100, with an additional “Other” option. Clicking on “Other” would reveal that the actual minimum amount to reload is $10. After clicking on the “Manage” in the payment section, users have the option to “Edit Payment Methods” or “Add Starbucks Card”. Since the user wanted to add a credit card, the second option seems very promising. Users did not realize that the calories were not updated and was no longer valid after their customization. 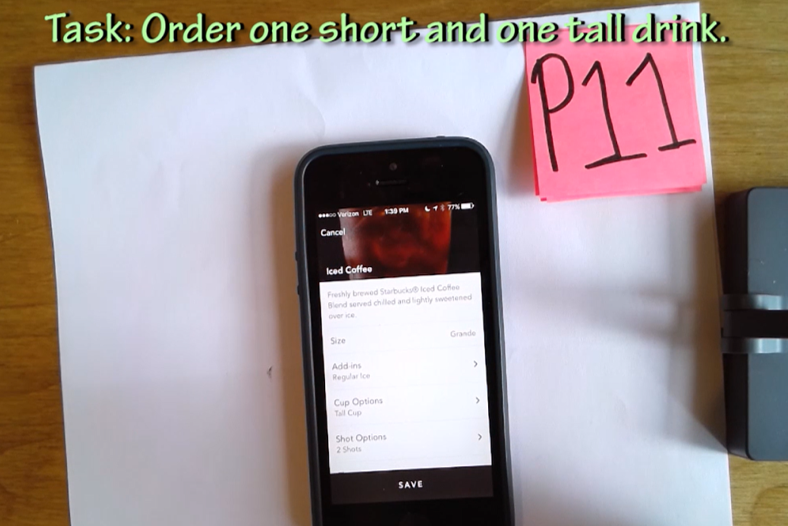 Users may select the size of the cup for the drink to be served in, which is different from the actual drink size. One of our users misunderstood the cup size for the size of the drink. Lastly, we provide suggestions for making changes to the app on a scale of 0 to 5 (0 being nice to have, 5 being strongly suggested). Participants had difficulty finding the price and expect them to be listed on the menu. Providing this information beforehand avoids the trouble of having to select the store and go through to the checkout process. For a more logical understanding, the first options shown should start with the smallest amount then incrementally increase with a “More” option for higher values. For example the options should be $10, $15, $20, $25, $30, More. 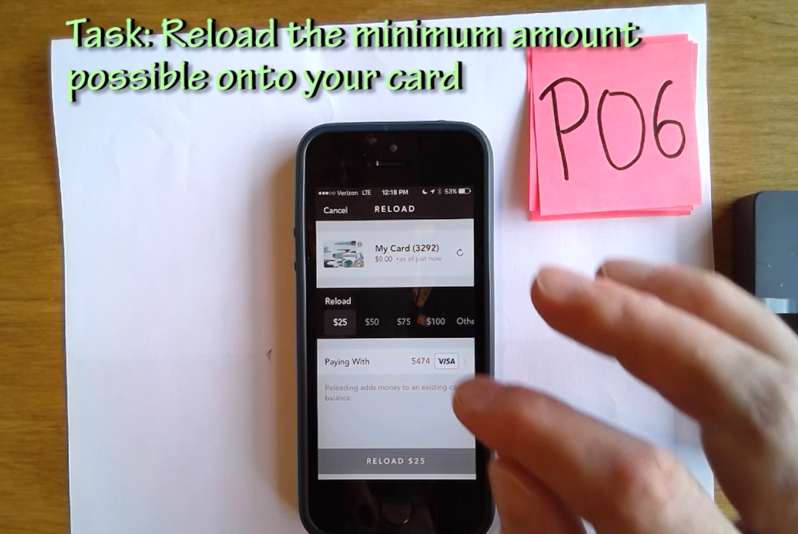 Instead of requiring the users to go inside the “Edit Payment Methods” section to add a credit card, there should be an additional “Add Payment Methods” option clearly visible at the same menu level with “Add Starbucks Card”. The application can implement additional features to calculate new nutrition facts based on the user’s customization. Alternatively, a note saying that the calories does not account to customization can be added to the top of the nutrition list if this change are not to be implemented. “Size” and “Cup options” can be easily misunderstood, hence the cup size option should use a less ambiguous terminology, such as “Container size”. While we are aware that several of the identified issues may have been a result of stakeholder’s decisions, our team has evaluated the studies based on actual observations with real users with the goal to report these findings as accurately as possible. Our team have gained an articulate amount of experience in performing hands-on usability testing, recruiting participants in a real environment, and drawing conclusions from our records and observations. We hope this study would bring useful insights for future enhancements. This is crucial to the design of a successful application. 2. The document camera drew our participants interest and evokes professionalism. This was extremely helpful in our recruiting process, especially with the lack of tangible incentives. 3. Determine what needs to be done to reset the testing device beforehand. It's extremely important to clear all added cards, settings, and small details before proceeding to the next session.